Environmentalists lost the Salt Lake City soccer complex battle—but the larger war for restoration has just begun. While some are cheering the 23-acre riparian restoration area planned to abut a nearly 200-acre soccer complex in north Salt Lake City, one Jordan River expert calls the whole plan a “tragedy.” Lake and river expert Theron Miller says the city could have the soccer stadium and still better integrate a more-natural Jordan River, but Salt Lake City Councilman Soren Simonsen said that battle is basically lost and urges environmental activists to focus their sights on the future. Walking along land that will soon host the city’s $22-million soccer complex—east of the 2100 North exit off Interstate 215—you can hardly see the Jordan River. That laggard section of the river is channeled unnaturally and hidden by thick walls of invasive species like Siberian elm and Russian olive trees. The mucky, muddy river here is a mere trickle of what it could be because the majority of Jordan River water is diverted at 2100 South to a channel that delivers the water through Salt Lake City to the Great Salt Lake to prevent flooding. That surplus channel was constructed in 1885, according to a report authored by SWCA Environmental Consultants (pdf) on behalf of Salt Lake City. The land that will host around 16 soccer fields was once dotted by willow trees and wetlands, but by 1902, was denuded of the willows and already hosted a sewage farm, according to the SWCA report. That’s the familiar story of the Jordan River: tamed by engineering and polluted by humans until it was little more than a stinking flood risk. 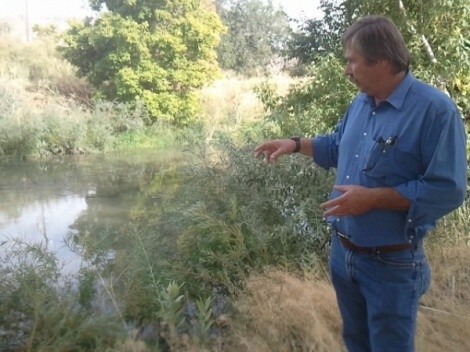 But momentum to restore a more-natural Jordan River has been building since at least the 1980s, and some residents opposed using any of the publicly-owned land for soccer fields, preferring instead to use one of the largest tracts of publicly-owned open space along the river’s 52-mile run to create its largest nature preserve. But Theron Miller sees a third option. The city can have its cake and eat it, too, he says, because soccer fields make great flood planes. Miller is a former water quality regulator and limnologist—one who studies lakes and streams—with the Utah Department of Environmental Quality. He now works for a consortium of sewage treatment plants—the Jordan River-Farmington Bay Water Quality Council. He studies the sewage treatment plants’ effluence’s impact on waterways. Miller says developing the soccer-complex land so that it’s intentionally flooded with rushing river water, say, once every 10 or 20 years, would help the river with its biggest impediment: sediment. Eroded artificial banks allow mud into the water. Terrible habitat, that is, for invertebrates and algae that serve as fish food. Salt Lake City plans to improve the banks and allow some flooding—but the city’s idea of a flood plane is a shallow tea cup compared to the great sea that Miller has in mind. Salt Lake City intends to build structures a few inches off the ground to protect them from marshy flooding from occasional high groundwater, while Miller would like to see protected building constructed six to eight feet higher than level grade to protect them from river water rushing onto the fields. But that’s not likely to happen, as construction of the current plan is scheduled to begin shortly. The city’s plan calls for an 8-foot berm that would prevent river flooding of the soccer fields. The berm will separate the playing fields from the 100- to 300-foot wide natural area intended mostly for nesting habitat, boardwalks and observation points. Miller would like to see at least 500 feet of buffer—on both sides of the river—but that would eliminate a few soccer fields, something the city isn’t willing to do. The tragedy, Miller says, is the land is almost entirely publicly owned, and rebuilding the river in a natural way anywhere else will cost millions more. But Miller’s plan would seem to damage sprinkler systems and other trappings of a manicured, monoculture sports field. Tom Ward, deputy director of public works for Salt Lake City, says an even larger problem exists in Miller’s plan. A swath of land at least a mile wide would need to be obtained to make his flood-plain plan safe for neighboring communities, Ward says. Disappointed as he is, Simonsen said environmentalists have bigger, future concerns that are emerging, including the 19,000-acre Northwest Quadrant. That area adjacent to Great Salt Lake is owned largely by The Church of Jesus Christ of Latter-day Saints, which wants to develop it but needs city approval.